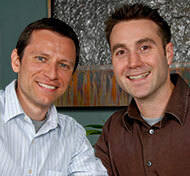 As Monroeville chiropractors, we take pride in offering state-of-the-art natural health care for our area. We’re always attending seminars and learning new ways to help health-conscious Monroeville-area residents. Our commitment to volunteering information and explaining everything in advance is often mentioned by our delighted patient. Tour our site and call our Monroeville chiropractic office to schedule an appointment with us today. My first experience with a chiropractor and it was awesome. I felt relief from the pain after the first visit. All of the staff were very friendly. Definitely looking forward to feeling better with their help! Everyone was very friendly and helpful! Dr. Nick is really helping my arm! He is awesome! Dr. Gresock you were great with Grant. You connected with him which opened his level of comfort with you, in my opinion a key to his getting better. Thank you. Very professional staff and doctors. Will recommend to others and continue to schedule future appointments for myself. Reasonable rates for non-insurance coverage. I was surprised by pain relief from just 1 session. Thank you. Everything was great on my first visit and I look forward to my next one! The staff at Gresock & Morgante are very caring and professional attentive to your needs. My first experience with a chiropractor and I found Dr. Morgante to be very helpful. He made my visit a pleasant helpful one. I would highly recommend him. I was very happy with my first visit to the office! The staff was so polite and cheerful. I am so happy to have found a new chiropractor office. This was my first chiropractic visit and it was great. Comfortable environment and friendly, personable physicians and therapists. That sums it up! Great staff and service. Very comfortable environment.